The antiques experts at Kovels have just published a new special report — Kovels’ Identification Guide to Contemporary American Pottery, 1960s to Present. Now is the time to buy pottery by contemporary makers and Kovels’ bird’s-eye view of bold, new shapes and pottery styles, artists, marks, and prices can help. Zanjo teapot by Philip Cornelius, 1981, sold for $665. Kovels has a new special report — Kovels’ Identification Guide to Contemporary American Pottery, 1960s to Present. It's an introduction to studio potters whose vases once sold for $20 and now bring hundreds or even thousands, as well as potters whose work is still unrecognized. Included are more than 50 pottery artists, each listed with a short biography, working dates, a mark and a piece that typifies their style, along with its selling price. A second section lists 120 more artists and their marks. A supplement with up-to-date selling prices comes with the report. Twenty-five years ago, the Kovels’ wrote one of the first books about Art Pottery, introducing works by Rookwood, Roseville, Van Briggle and others. Many were not yet “discovered” and not found in marks books or antiques columns. Prices were often under $20. Today these same makers sell for up to $10,000. Now, unusual contemporary ceramics can be found at garage sales, flea markets, and local or college art shows. The Kovels have done the research, located the hard-to-find marks, and added pictures, descriptions, dimensions, and prices to help collectors recognize and identify the hidden values of contemporary pottery. 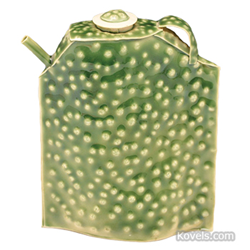 “Kovels’ Identification Guide to Contemporary American Pottery, 1960s to Present” is available only at Kovels.com. Terry Kovel is America’s foremost authority on antiques and collectibles. She is the well-known columnist and author of more than 100 books on antiques and collecting. With her daughter, Kim Kovel, she co-authors the best-selling annual "Kovels’ Antiques and Collectibles Price Guide." The 2016 edition is now available at Kovelsonlinestore.com and local bookstores. They will discuss antiques and collectibles topics with accredited media. Photographs are available. Contact pr(at)kovels(dot)com. Kovels.com, created by Terry Kovel and Kim Kovel, provides collectors and researchers with up-to-date and accurate information on antiques and collectibles. The company was founded in 1953 by Terry Kovel and her late husband, Ralph. Since then, Kovels’ has written some of America’s most popular books and articles about antiques, including the best-selling "Kovels’ Antiques and Collectibles Price Guide," now available in its 48th edition. The website, Kovels.com, online since 1998, offers more than a million free prices, and includes a free weekly email, “Kovels Komments.” It gives readers a bird’s-eye view of the market through the latest news, auction reports, a Marks Dictionary, readers’ questions and answers and much more.